Since Reform and Opening in 1978, and especially in the last decade, China’s economic growth has been remarkable. With annual growth rates around 10%, analysts have marveled at the success of the country’s export-led model of development. Today, it’s unclear how long China can sustain such rapid growth, and to what extent exports should be balanced with domestic consumption. At the same time, pursuit of a robust economy is one of the primary avenues through which central and local governments claim legitimacy and justify certain sacrifices. So while researchers and policy makers try to figure out the most appropriate growth rate for continuing the headlong march towards ideas and goals of development and social stability, increasing incidents of protest — whether around degrading environments, working conditions, or political freedoms — suggest the challenges that lie ahead. In the wake of economic growth and transition we need to also assess how the processes of modernization, industrialization, and development have been, and are being, experienced differently by different groups of people in China. We need to critically examine the environmental and human health implications of China’s export-led development model. We need to frame the idea of development itself as a contested process, and not simply a imminent, unidirectional, one-size-fits-all model the inevitably leads to improved living and working conditions for all. Furthermore, we need to understand the challenges and opportunities of ecologically sustainable and socially inclusive development in China in particular, and in the world in general. These are some of the themes and issues we examine in my class, China in Transition. First-year students read and learn about the politics and practices of labor, environmental, agrarian, and dietary transitions in post-reform China, analyzing the actors, mechanisms, and consequences of these changes. We consider development in China from a sociological perspective that goes beyond economic measures of growth to ask questions about equity and sustainability. Throughout the course students write about the costs and benefits of economic development as it is practiced in China today. This term, I assigned a “Writing for the Real World” essay in preparation for students’ final research projects. I asked them to find an article from the popular press that relates to themes we’ve been working on in the course, and that might be a topic for their research papers. I then asked them to write a short, cogent essay that includes a call to action for addressing the challenges they raise in the piece. With student permission, I’m sharing some of their work here, in the “real world” of Pig Penning. Please have a look at the essays posted in the guest blogs tab. You’ll find commentary on China’s push for green energy, challenges associated with e-waste processing, the obesity epidemic, and the relationships between consumerism and environmental degradation. If you care to comment, please do so; the authors will have access to respond. GRAIN just released a new report called Who Will Feed China: Agribusiness or Its Own Farmers? Decisions in Beijing Echo Around the World on August 4, 2012. Tom Philpott cited Feeding China’s Pigs in his article, China’s Other Sleeping Giant Is the Other White Meat, from Mother Jones, June 27, 2012. It’s kind of like the running of the bulls in Spain, but much more exciting. Central authorities in China are gearing up to open the gate on the strategic pork reserve. Considering that in 2010, Chinese people ate, on average, 4.2 million metric tons of pork each and every month, the 200,000 metric tons of meat from the reserve doesn’t quite amount to a stampede. Still, the hope is that this flood of flesh will help reduce soaring pork prices, and cool the rampant inflation that’s causing many households in China to go without, while worrying authorities who are determined to head off social unrest at the pass. Will it work? Doubtful. But that doesn’t mean that food reserves like this are any less of a good idea. In the meantime, it’s worth discussing why pork prices are rising to such a degree, and what these increases mean for Chinese farmers. Recall for a moment the so-called “world food price crisis” from 2007-2008. Many analysts at that time chalked the rapid rise in food price up to “a perfect storm” of drought- and weather-induced crop shortfalls, increased demand for meat products in Asia, and declining grain stocks worldwide. Others added to this mix the impacts associated with diverting cropland to biofuel production, commodity speculation, legacies of agricultural trade liberalization in poor countries, and the political and economic power that a handful of transnational agribusiness firms wield in controlling the particularities of the global food system (working in conjunction with the WTO, various state governments, banks, the IMF, etc.). Let’s not forget that those agribusiness giants reigned in RECORD PROFITS during 2007-2008, at the same time that number of hungry in the world surpassed one billion. The food crisis, which never went away, is a systemic crisis inherent in the way that food and agriculture are organized, legislated, controlled, and experienced…and some of these mechanisms are at play in the “pork price crisis” happening in China today. Food price is a complex beast, described only partially by basic economic theory. Yes, Chinese people on average are eating more pork than at any other time in the country’s history, and yes, national annual consumption accounts for half of all the pork in the world. These trends are labeled as “demand.” At the same time, the pork industry in China is a new frontier for both domestic and international investors, increasing the supply of pigs and pork, and spurring the development of an increasingly industrialized hog sector. Vertically integrated pork packers and retailers are bringing meat to China’s urban middle and upper class consumers in quantities that make the strategic pork reserve seem ridiculous. Increased supply, coupled with the hangover from decades of meat rationing and unfulfilled pork dreams certainly play important roles in the cultural drive for more regular pork dinners. But it isn’t the case that high pork prices are solely the result of supply not keeping up with demand, even if we factor in production shortfalls, rising costs of labour, urbanization, and overall rising production and living costs. My concerns tend to center on how these kinds of issues affect the lives of the world’s most vulnerable populations, who, more often than not, are rural smallholder farmers. 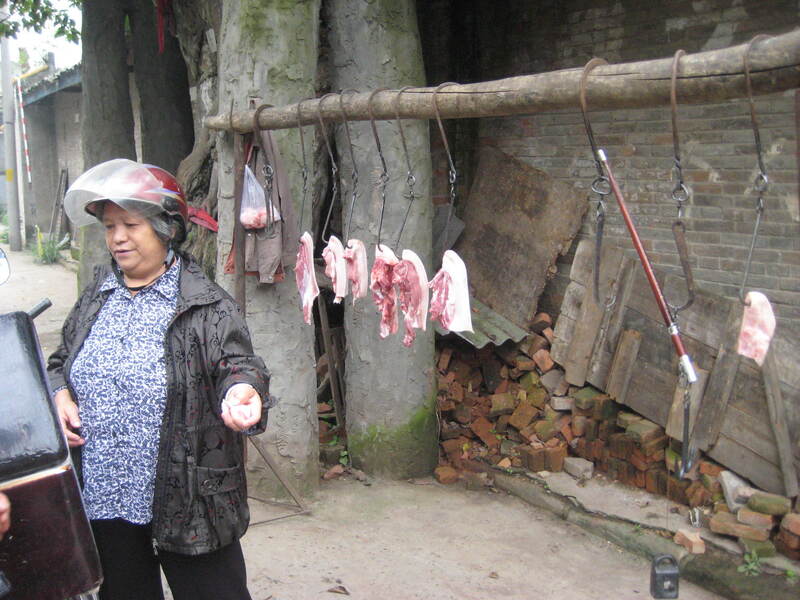 What does the pork price crisis look like for smallholders in China? Recent headlines tell us that farmers are doing well, capitalizing on high consumer prices. We heard that in 2007 and 2008 too. But who are these farmers who are making it big while everyone else complains and suffers from inflation? Consider again rising feed costs, which increase the most important cost of pig production. There are “farmers” who can weather this storm, provided their operation is big enough to take advantage of economies of scale. If they run a vertically integrated firm that has its hands in feed production and animal husbandry at the same time, even better. These big dogs, who are becoming increasingly common and powerful in China, will likely be able to take advantage of high pork prices. They’ll make it. They might even profit handsomely. They’ll be supported by investment, technology, policy, and subsidies. If clenbuterol didn’t ruin Shuanghui (Shineway), high feed costs won’t make a dent. On the other hand, most of the smallholder farmers I met in China in 2010 (and the millions I didn’t meet) won’t be faring so well. Even the smallest “backyard” farmer who raises only two pigs each year struggle to afford feed when the price increases as it has this year. These farmers are already excluded from cashing in on the booming pork market in a number of ways. They’re often far-removed from urban markets and contractors, and they can’t meet changing industry standards for lean pork. As retail standards in China start to look more like those in the US and elsewhere, fatty pork, though it’s preferred by most Chinese people and lends itself to Chinese cooking, is being replaced by pork with a lower fat-to-lean ratio. This kind of meat can only be achieved by raising pigs on grain, or at the very least, by feeding grain at the right point in the production cycle. For smallholders, if they have to feed grain to meet market standards, and if the price of grain increases even a little bit, they are left out. The central government has been promoting cooperation among small farmers in an effort to help them realize economies of scale, but even these “specialized household farmers” (who raise pigs exclusively) are challenged by rising feed prices and fluctuations in pork price. We don’t need to worry about whether or not China can produce enough pork to meet domestic demand (demand understood, of course, as a highly unequal construct). We do need to worry about whether that demand, and the supply of food (and feed) diverted to fulfill it, means that hundreds of millions of people are going to struggle to meet even basic dietary and livelihood needs. Income from family members working in factories and on construction sites in cities can help rural households with their food bills, but this is not a sustainable solution. I shudder when I read this quote from a Financial Times article. “With pork prices so high, today all we can afford to eat is this stuff,” she says, gesturing to green weeds growing among the debris in her yard. All I can think of is the image of Haitians eating mud and grass patties in 2008 because rice was too expensive. It’s not the same story, but it’s not as different as we might think. I’m not arguing that feed cost is THE cause of rising pork prices. I don’t think there is a single cause. For me, it’s primarily a structural problem, but looking at the feed industry in relation to the livestock industry is useful way in to thinking about the problem. Starting in 1979, pork became the most produced and consumed meat in the world. The reason for its ascent to the top of the global meat heap is simple: China. In 2010 alone, farmers and companies in China produced more than 50 million metric tons of pork, virtually all of which was sold and consumed domestically. This Chinese pork boom, which today accounts for half of all the pork in the world, is the result of a set of policies and trade agreements that liberalized and industrialized Chinese agriculture and enabled enormous production increases. In the quest to feed 21 percent of the world’s population on nine percent of its arable land, Chinese central authorities prioritize ensuring a steady supply of low-priced pork as an important component of food security (China maintains a strategic pork reserve, the only one of its kind in the world). 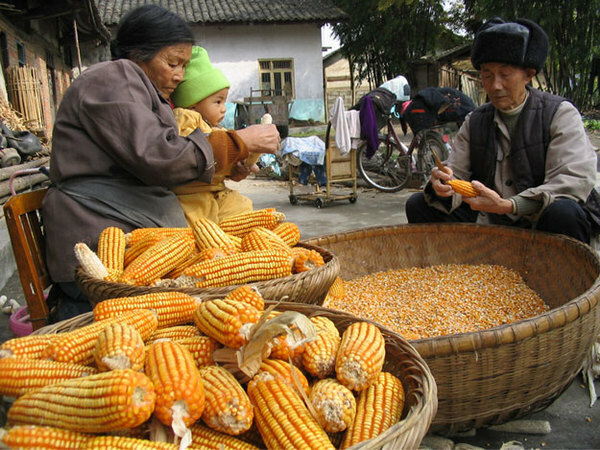 In the more than 30 years since Deng Xiaoping introduced the first major set of reforms to liberalize China’s economy in 1978, policies and investments have worked together to shape and implement a model of agricultural development that privileges industrial agriculture and increased meat production and consumption. While some of these measures have played a role in decreasing the number of hungry in the country, the crises of industrial agriculture are emerging, with serious implications for the environment, public health, smallholder farmers, and questions of food security. This report focuses on the pork sector in particular – including the feeding of swine – as it relates to these pressing issues and challenges. 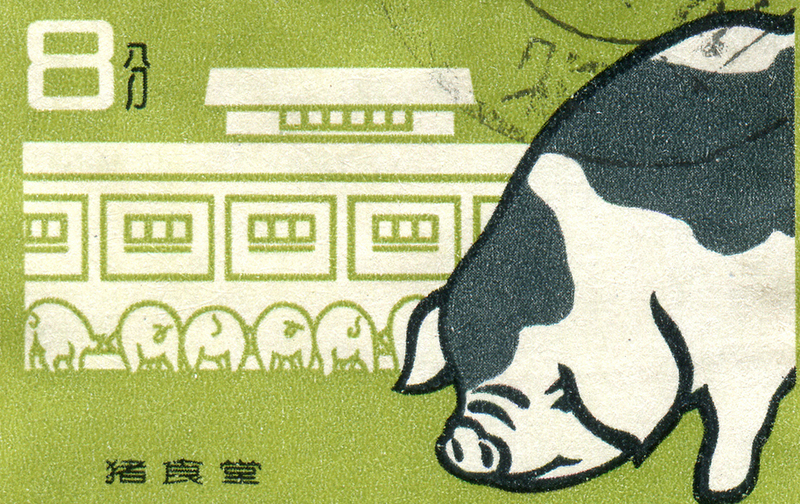 Long before “Reform and Opening”, pork was critically important in Chinese agriculture and diets. Pigs were domesticated in China some 10,000 years ago, and for millennia, virtually every rural household in China raised at least one or two pigs each year. Smallholders defined the structure of pig raising in China all the way up until the early 1980s, when industrial forms began to emerge. Today, smallholder farmers struggle to survive in the new market agro-economy, while specialized household producers and large-scale commercial operations are actively supported by policy and investment. A small number of vertically integrated, and predominantly domestic, agribusiness firms are claiming an ever-increasing share of pork production, processing, and marketing. Changes in swine feeding and China’s feedstuffs imports are at the heart of this shift. The industrialization of pig farming in China has taken place in concert with the development of a multi-billion dollar (US$) feed industry. Soybean imports are keeping the swine industry in China afloat. In order to overcome the limitations of domestic production for feeding millions of pigs, authorities enacted a series of measures to liberalize China’s soy trade, including those required by WTO accession protocols, starting in the early 1990s. Imports quickly overtook both soy exports and domestic production, and today, China is the world’s leading soybean importer. In 2010, more than 50 million metric tons of soybeans came into China, mostly from the United States and Brazil. These imported beans accounted for 73 percent of soy consumption in China, and were used exclusively in the production of soybean meal for livestock feed and soy oil for cooking (meal and oil are co-products in the soy crushing process). In stark contrast to the pork industry, which a handful of domestic companies dominate, transnational agribusiness firms including Archer Daniels Midland, Bunge, Cargill, Louis Dreyfus (together, ABCD), and Wilmar own about 70 percent of the soybean crushing industry in China. In recent years, measures have been enacted to cool the dominance of foreign firms in support of domestic operations. Whether or not these moves will be effective remains to be seen. The consequences of these changes in pig production and pig feeding have wide-ranging impacts. In terms of environmental degradation, agriculture in general and livestock farming in particular, are the most important sources of pollution in China. Livestock farms produce more than 4 billion tons of manure annually, much of which contributes to nutrient overload into waterways and subsequent eutrophication and dead zones. Globally, as more and more land is converted to intensive monocrop production of soybeans and corn (and others in a narrow range of industrial feed crops), pesticide and fertilizers pollute waterways, biodiversity declines, natural carbon sinks are destroyed, and greenhouse gases are emitted in all stages of intensive feed production and transport. Industrial pig feeding also carries a range public health concerns. China is becoming increasingly infamous as a site of food safety scandals, most of which stem from feed additives such as hormones and growth regulators ending up in meat and livestock products. On top of this, the prophylactic administration of antibiotics confined animal feeding operations (CAFOs) has resulted in antibiotic-resistant disease-causing organisms popping up in China, just as in the United States and Europe. Other threats to public health include the emergence of so-called diet related diseases of affluence, including Type 2 diabetes, coronary heart disease, obesity, and a range of cancers. At the same time, the current model of agricultural development has failed to close the gap in dietary and income inequalities that continue to plague China, especially in the form of differences between rural and urban populations. Beyond environmental and health impacts, increased liberalization of agriculture is taking a toll on China’s rural population. Smallholder farmers struggle to access markets, meet new market standards, cover costs of production, and maintain an adequate farm labor force. In the context of mass urban migration, many young and especially male rural residents are flooding China’s cities as migrant workers, leaving the elderly, women, and children to tend their households and farms alone. For its people, environment and penchant for self-sufficiency, a reassessment of the actual impacts of industrial pork production and pig feeding on China’s population and environment is needed. Redirecting research and subsidies from industrial systems to locally embedded systems, while maintaining food reserves, are steps in the right direction toward serving national food security, environment, and development needs. The snow that graced the city last week amid the rumble of spring festival firecrackers, still lighting up the night sky and contributing intermittent booms throughout the day, was a welcome respite to this excessively dry Beijing winter. 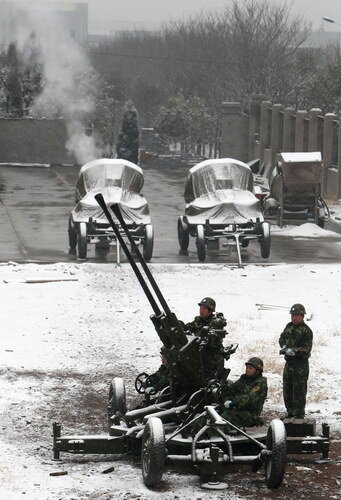 The 1 mm of snow that dusted the capital from February 9-10, and the additional 1.7-3.1 mm on February 13, were acts of a central government desperate to combat the worst drought China has experienced in 60 years. Before last week, there had been no precipitation in Beijing for 108 consecutive days, making this the latest first snow since 1950. The entire North China plain is suffering from inadequate precipitation, with potentially disasterous consequences for the upcoming spring harvest of winter wheat. On February 8, the Food and Agriculture Organization of the United Nations issued a ‘special alert‘ (pdf) on on this issue, warning that if temperatures in February sink or if the current drought continues into spring, as many as 5.16 million hectares of the total 14 million hectares planted to winter wheat in China could be adversely affected. The drought is particularly serious in Shandong, Jiangsu, Henan, Hebei, and Shanxi provinces, together home to 60% of the area planted to winter wheat in China and two-thirds of national wheat production. A crop failure of this magnitude would be calamitous. Already, farmers are struggling to make ends meet, food prices are rising, and the countryside is strapped for water supply. While Chinese authorities are, of course, primarily concerned with the consequences of drought and the possibility of a much diminished wheat harvest within China, international analysts are focused on what the situation might mean for global wheat supplies and prices. China is the world’s largest wheat producer and consumer, and is largely self-sufficient, with wheat imports and exports paling in comparison. If the spring winter wheat crop fails, or is significantly reduced, China will no doubt import to make up for the shortfall. Already, wheat prices and futures are increasing both in China and on the CBOT; the same kind of price speculation that played a role in the world food price crisis in 2007-2008. So while farmers in the North China Plain are bracing for crop losses that will squash their already meager annual incomes, 2.57 million people in China are facing drinking water shortages, and the poor around the world are struggling to afford once-again increasing foodstuffs, international grain traders are gearing up for what will likely be another year of record profits. The food crisis never ended. Drought in China simply adds just one more page to the long, unfolding history of crisis and inequality that defines the current global order and the global food system. All the artificially-induced snow in the world can’t save us now.